Interview: She portrays a middle-aged wife trapped in a loveless marriage in Porchlight’s production of the Harvey Fierstein-John Bucchino musical, at Stage 773 through April 1. 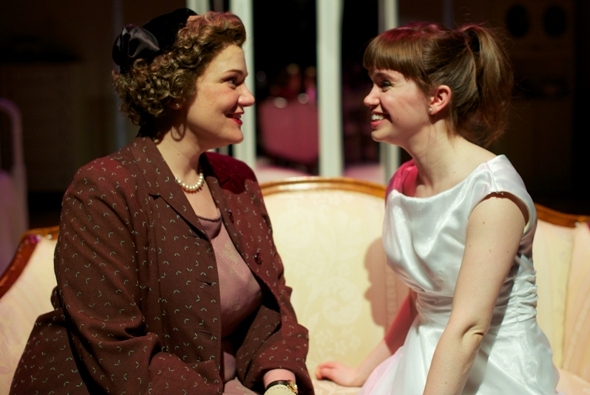 So perfectly does Rebecca Finnegan blend her painful lyric pauses into the narrative flow of “A Catered Affair,” at Porchlight Music Theater, that you scarcely notice she has ramped up from speech to song. Then the swelling power of that voice grabs you, and you realize you’re watching something special: an accomplished actor who’s also a genuine singer. “I love, love, love to sing,” declares Finnegan at the top of an interview about how she brings off the emotionally wrenching character of Aggie, the desolate wife and mother at the musical’s center. From its opening on Broadway in 2008, “A Catered Affair” – with music and lyrics by John Bucchino and a book by Harvey Fierstein based on Paddy Chayefsky’s 1955 television play and Gore Vidal’s 1956 screenplay – has endured mixed critical assessment for exactly the quality Finnegan likes so much about it: the tight weave of music and drama. Its fine, subtle score boasts no real show-stopping numbers. 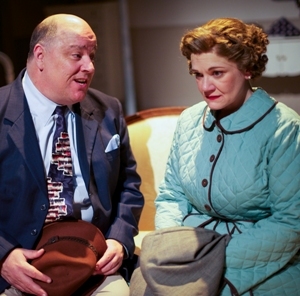 Aggie is a middle-aged working-class mom in an Irish-Catholic neighborhood of 1950s Brooklyn. Her home is a modest apartment she shares with husband Tom, part owner of taxi cab; their daughter Janey, whose impending wedding is the affair in question; and Aggie’s gay brother Winston. It is a loveless marriage in a spiritually oppressed household. 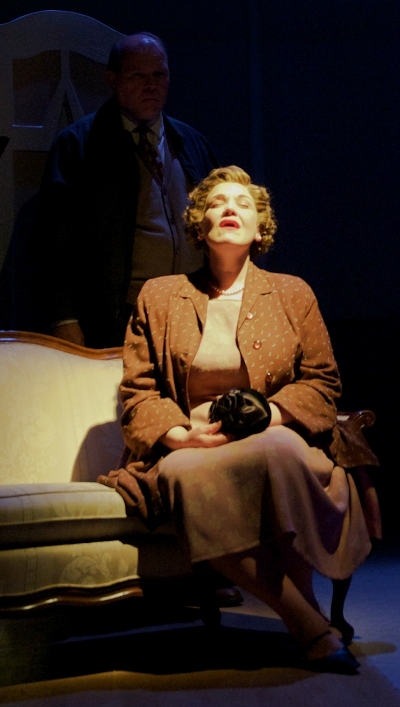 If the role of Aggie is an emotional grind for the audience, Finnegan – nearly unrecognizable in her wig and makeup — says she bears that skin by sublimating the painful emotion through physical as well as vocal expression. Yet it isn’t the wedding that lies at the core of “A Catered Affair,” it’s the looming crisis in the old, stagnant marriage of Aggie and Tom (Craig Spidle). “Their marriage is empty,” says Finnegan. “A lot of what we need to know about that is in the text. She became pregnant before they were married. Her father basically bought Tom by buying him a part ownership in the cab. So now they sort of fumble around each other, and they both suffer the rips and tears that happen emotionally when you’re protecting yourself. And you still end up being injured. The odd man out here is Uncle Winston (Jerry O’Boyle), Maggie’s brother – tacitly gay — and longtime boarder in her household. Odd because he’s the least repressed, and the one person Aggie can turn to. Finnegan says she worked out a backstory for Winston. Of all the challenges the role of Aggie has presented, says Finnegan, the greatest from the beginning of rehearsals was to cope with the emotional impact of John Bucchino’s songs without breaking down.